In January 2009, Giskan Solotaroff & Anderson LLP filed a class action lawsuit against JP Morgan Chase & Co. and Chase Manhattan Bank USA, N.A. (collectively, "Chase"), on behalf of a class of customers who have been charged a monthly service fee on balance transfers to their Chase credit cards that have low fixed APRs for the life of the loan. In Chase's original agreement, Chase represented to its customers that to keep the low interest rates, the customers must only make timely required payments to Chase and the customers' creditors. As set forth in the complaint, lead Plaintiffs allege, on behalf of a class of similarly-situated customers, that Chase imposes, in violation of Federal and State law, a $10 monthly service charge and an increased minimum monthly payment on customers who wish to maintain the promised low fixed APR. On August 9, 2012, the Court granted preliminary approval of a $100 million settlement that will resolve all claims in the class action lawsuit. Notice will be mailed to class members no later than August 24, 2012. For further information, please see www.chaseminpaymentlawsuit.com. To obtain more information about the lawsuit, please use this form. 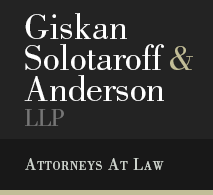 Note that Giskan Solotaroff & Anderson LLP will handle all received information as strictly confidential.